However, being my Dad's favorite daughter (and yes, I am the ONLY daughter, as my younger brother likes to point out), I wanted to do something special for him (besides doing all the organizating, etc ....but that didn't seem too personal to me, ya know?). I decided that I would make him a memory quilt of the event. I stationed one of my daughters at the entrance to the room with a guest list. As each guest arrived, their name was checked off; they were informed that we would like to take their picture and have them sign their names. My nephew manned the digital camera and took the pictures. Instead of the guests signing a guest register, that NO ONE reads afterwards, I had another daughter catch them after the picture taking so they could sign prepared fabric with a Pigma pen. Knowing that virtually none of the people attending did any sort of sewing and a "don't sign in the seam allowance" would be a foreign phrase, I made windowed cutouts from freezer paper. I cut strips of fabric about 6" wide by width of fabric. (The photo block was 6" square). I ironed freezer paper to the back of this long strip to stablize it. So that the signatures would be properly spaced and I would have enough room to work with, I cut another piece of freezer paper, to be ironed on the front, with cutouts for the signatures. Essentially this piece of freezer paper looked like a ladder, with the signatures being written between the "rungs" of the ladder. The signatures would later be cut apart and sewn onto the photo blocks. Once home, I did some basic red-eye correction, (*really* basic) color corrections and cropped the pictures as appropriate. Using fabric previously prepared with Bubble Jet Set, I printed the pictures on the 6" blocks of fabric, without the signatures at this point. I wanted to be sure the pictures printed properly before the signature of the person was sewn onto the block. I was terrified that if I had the guests write on the 6" block that their picture was to be printed on (at a later date) and the picture didn't print nicely, I wouldn't have a second chance. So .. the alternative for me was to separate the signature from the picture ... make sure the picture on the fabric was as good as I could get it and THEN sew the signature strip onto the photo block. This actually worked out rather well. I had looked through many, many, many books to find a layout that pleased me, wasn't too terribly complicated to make (because I really wanted to get the quilt completed BEFORE my Dad died, ya know? Not that he is in ill-health, but my level of procrastination is such that I might have been hard-pressed to get the memory quilt finished to be his shroud. [sigh]). The photo blocks are 6" snowball blocks, which alternate with 9-patch blocks. 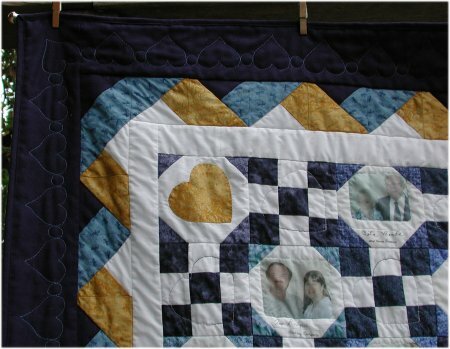 There are (machine) appliqued heart blocks in each of the 4 corners. There are 2 inner borders: one plain, the other pieced. It's finished with a wide plain border. 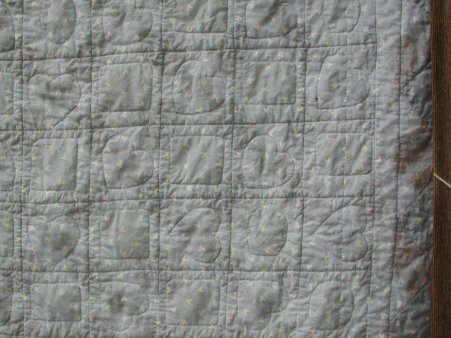 For the quilting, I stablized the quilt by first stitching in the ditch, in both directions (horizontal & vertical) alongside all the blocks. I quilted a heart (the same heart as in the appliqued corners) in each of the 9-patch blocks using variegated thread. The photo blocks were outline quilted. The first plain inner border, I left alone; the second pieced border, I stitched in the ditch. 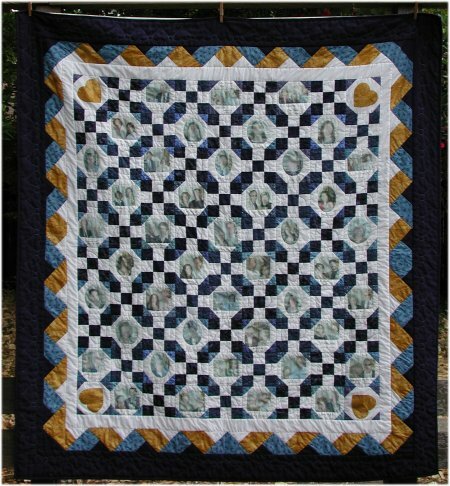 In the wide outer border, I quilted continuous line hearts in a blue metallic thread. The backing is undecorated but the print coordinates with the front .. it's a soft blue with white hearts and "LOVE" printed on it. It turned out to be a "personal-sized" cozy quilt ... 64" x 69".